“Adoption of multicore QorIQ processors among customers targeting wired and wireless communications processors is strong and getting stronger,” said Brett Butler, vice president and general manager of Freescale’s Networking Processor Division. The EE Daily News interviewed Sergis Mushell, Principal Research Analyst at Gartner for CPU, GPU, and storage semiconductors, to gain further insight into the study and the communications processor market in general. According to Mushell, while companies like NetLogic and Cavium are growing, in the communication processor market "too much emphasis has been placed on the smaller companies and niche applications". He points out that it is important to keep in mind the different requirements of control plane and data plane functions. Freescale has an advantage over competitors, says Mushell, with a deep understanding of the software required to efficiently handle packets of data. He notes that this is an advantage that goes back to the company's origins in Motorola. with a 72.3% share, while NetLogic rose to 2nd place in 2010 with a 9.2% share. Scale is a critical attribute for a communications processor vendor, and Mushell says that Freescale is the "only one that qualifies" with the medium scale that is best suited for this market. ASICs are getting too expensive for smaller companies to produce, while a company with the size of Intel is too large to be interested in customizing devices with the I/Os that are required in different networking applications, he says. Freescale, on the other hand, is of a size where they are open to design ASICs to meet communication processor market requirements. Mushell advises though, to keep an eye on Intel in the storage market, where their ability to integrate many cores can be an advantage. 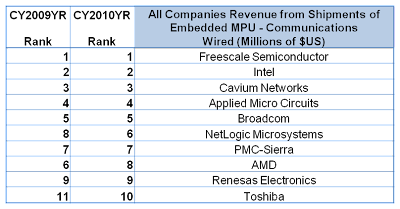 According to Gartner's analysis, the consumer segment for embedded MPUs shrunk in 2010, from $504M to $425M. Freescale was able to grow their share in this segment to 65.2% ($277M), while U.S. competitors Intel, Netlogic, and IBM each experienced declines. 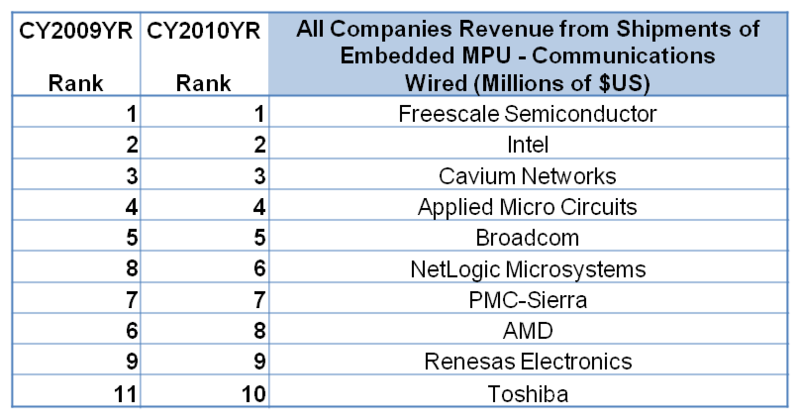 It is interesting to note the ascension of Chinese vendor Shenzen, who grew 50% while rising from 10th to 8th position in consumer applications of embedded MPUs.